UBC is committed to ensuring its world class learning and instruction opportunities are conducted in a copyright compliant fashion. This document set’s out UBC’s requirements regarding copyright, which faculty members and staff must adhere to in order to comply with copyright laws. Download the PDF or visit the Copyright Requirements Page. These Fair Dealing Requirements only deal with copying by faculty members and staff of UBC within the fair dealing exception to copyright infringement provided under the Copyright Act. Download the PDF or visit the Fair Dealing Requirements Page. These notes are intended to clarify the application of the Fair Dealing Requirements to copying in a variety of different contexts, including teaching, research, learning management systems, and more. 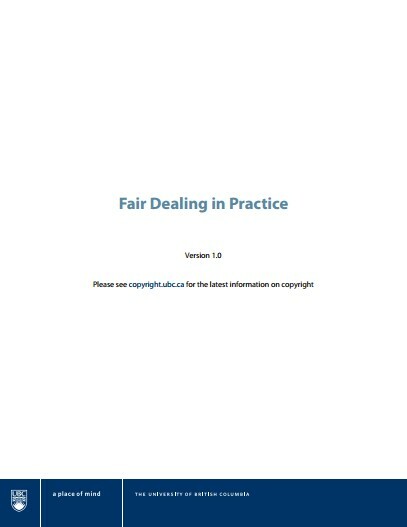 Download the PDF or visit the Fair Dealing in Practice Page. UBC is required to pay SOCAN and Re:sound tariffs when it rents out its facilities for events that play music. While SOCAN collects fees on behalf of composers, authors and music publishers, Re:Sound collects fees on behalf of the rights owners of the sound recordings. This document provides some general information about SOCAN and Re:Sound fees and potential applicability of these fees to UBC facilities. Visit the UBC Information about SOCAN and Re:Sound page.